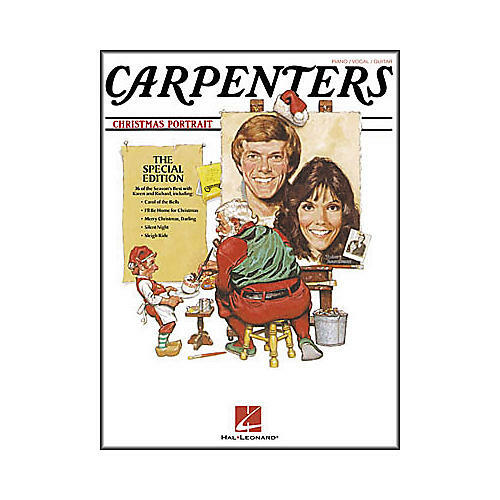 Music book for the Carpenter's 1978 Christmas album. This stellar collection features piano, vocal, guitar arrangements of all the songs from Karen and Richard Carpenter's million-selling 1978 Christmas album Christmas Portrait. The songbook gives you sheet music, chords, and lyrics for 36 of the holiday season's best songs: Ave Maria; Carol of the Bells; Christ Is Born; The Christmas Song; The Christmas Waltz; Have Yourself a Merry Little Christmas; Home for the Holidays; I'll Be Home for Christmas; It Came upon a Midnight Clear; It's Christmas Time; Little Altar Boy; Merry Christmas, Darling; O Holy Night; Santa Claus Is Comin' to Town; Silent Night; Sleigh Ride; and more!